Medical barcode download is effective and powerful application to administer healthcare industries through reliable, cheaper and protected medical barcode images. Medical barcode download is effective and powerful application to administer healthcare industries through reliable, cheaper and protected medical barcode images. Medical barcode generator software is more accepted among Pathological Labs, Surgical equipment supplier, Nursing Home, Hospitals, Pharmaceutical industry, Healthcare centers, Blood banks and Medical wholesalers to manage important documents. Medical barcode download application creates barcode objects in linear or 2D dimensions similar to Code 128 SET A, Aztec Font, Coda bar, Code 39 Full ASCII, UCC/EAN-128, UPCE, LOGMARS, DataMatrix Font, LOGMARS, PDF417 Font etc with attractive designing objects akin to pencil, ellipse, triangle, line, text, arc, rectangle and more. 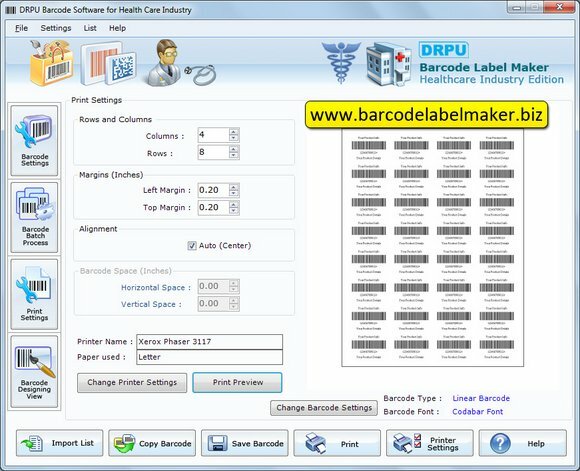 Medical barcode download software saves all designed medical barcode labels in key file formats similar to png, tiff, exif, bmp, gif, wmf, jpeg, emf, jpf for further utilizes. Barcode generator software presents attractive GUI interface so that non technical users can admittance software frankly without any industrialized guidance obligatory. Medical barcode designer application is more useful to control patient's records, check medical equipment status, product details, medicines and etc. Software allows downloading free edition to distinguish software elements and operational capabilities without any added charges. Medical barcode download software maintains low system requirement for installation similar to 18 MB free hard disk space, Pentium class or elevated processor, 256 MB Ram and supports major windows operating systems akin to Win Vista, Win 7, Win Server 2008, 2003, Win XP and etc. Features: * Medical barcode download application provides perfect solutions to manage healthcare business through medical barcode labels. * Barcode generator software designs several medical barcode images at solitary mouse tick. * Medical barcode creator application designs barcode in user specified styles by using advanced designing tools.